Delta News & Review: Can Gingrich Upset Romney in Florida? Can Gingrich Upset Romney in Florida? Florida's primary only allows those registered Republican to vote. The polls showing Romney ahead by 12 points may be skewed by unregistered Floridians answering the pollsters without knowing or caring that they effect false surveys. Polls have always been very subjective according to certain allegiances it's company panders to. Early poll results can and does effect later voting to a certain degree. Many voters vote more to be on the winning side than their convictions. if he gets all of Florida's delegates, he will not come out the winner...Newt and Rick's conservative policies will. Nevertheless, with a 3-5% error margin accompanied by polling unregistered Republicans the polls are wrong and Gingrich will pull off another upset. The 'liberal Press' (calling that media "Press" is compliment not deserved) seems these days to be running their own "Shadow Super-PAC" and since we see they have used KID GLOVES on Romney, it's obvious who they would rather deal with if (when) Obama is defeated. Their preference to Romney is based in their hopes he will not put Abortion, Gay marriage, and other conservative social issues on his priority list. The "Drive by Media" will not be able to ambush Gingrich in interviews to diminish his presidency as easy as apparent it will be in Romney's case. Romney just is not good unless he is scripted. By not hitting him hard now, they hope to demolish him if he gets the nomination and make him interview "shy" thereafter, thus giving their candidates and issues more press. 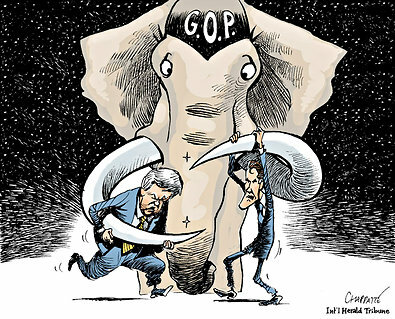 To diminish conservative ideas and issues will also dictate House and Senate races in 2012. The "powers that be" behind the mainstream media who have hijacked our impartial press, constitute a declaration of "war" over our sovereign right of free elections. The obvious power that the media has over our minds (granted mostly lazy minds) to influence our decisions is Orwellian and the ingredients that cause liberty to wilt and disappear. The 5-10 % of the thoroughly "susceptible minds" are all they need to control elections. Perhaps the "Republican Establishment" who obviously are in collusion with the would-be Kingmakers...have been emasculated by the Tea Party and Independents who are "Mad as _ _ _ _, and are not going to take it (networks brainwashing) anymore!